The Integrated Data Viewer provides a Color Table Editor which supports editing existing color tables and creating new ones. A color table is an ordered collection of colors that is used to color a display according to a range of data values. 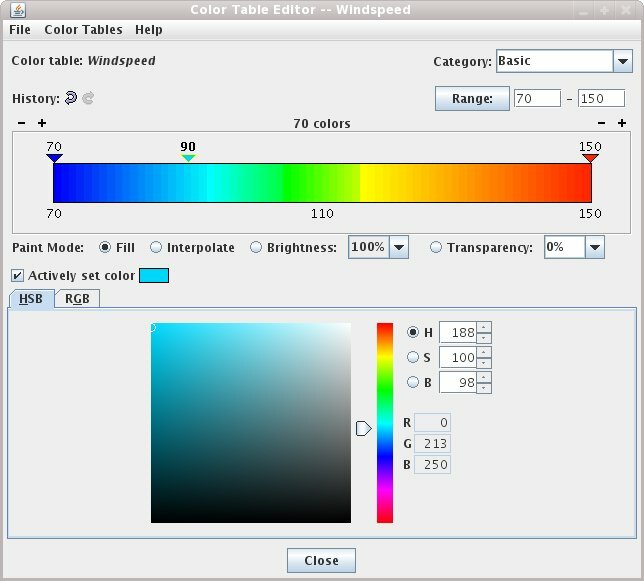 The Color Table Editor can be used stand-alone by selecting the Tools->Color Table Editor menu item from the main menu bar. It can also be used or in conjunction with a particular display by clicking on the display's color bar in the legend, or through the display's edit menu. When used in conjunction with a particular display the changes you make to the color table are applied to the display as you make them. To turn this off use the Auto Update check box in the lower right corner of the window. Color tables are grouped into categories, as illustrated. The illustration shows the color tables for the "Basic" category. Click on a category and then on a color table to select. To switch to the newly selected color table for a display on screen, click on OK in the bottom of the Color Table Editor, and the editor will close, or click on Apply to keep the editor in use. If Auto Update is checked the change takes place without further action by you, as soon as you select a new color table. The color table is shown in the bar of color across the window, the color legend. How many colors are in the table is shown in a label in the upper center, such as "70 colors." You can reduce or increase the number of colors by clicking on the -/+ choices near the left and right ends of the legend. New colors are added or removed at each end of the legend with the same color as the end color. Pressing Shift-Click on any of these buttons will add/remove 10 color slots at a time. Underneath the color legend is a black and white checker board pattern to help show the degree of transparency. Most color tables have zero transparency and the checker board is not visible. The History undo/redo buttons in the upper left allow you to step forward and backward through the changes you have made. Shift-clicking on these buttons will step forward/back 10 changes. The spectrum of colors spans a range of data values. The values are shown at the ends of the color legends. You can change the max and min of the range with the Range: pair of dialog boxes on the right. Enter the minimum and maximum values of the range you need, and click Apply or Ok, or press the Enter key. If the Color Table Editor is being used in conjunction with a display then when you change the range that range is applied to the display as well. You can "paint" in the color bar by just dragging the mouse within it. When your mouse is over the color bar the cursor will change to a paintbrush and a gray line is drawn to indicate the position of the cursor. The type of painting is specified by the Paint Mode buttons. Fill. When you drag it will fill the color table with the currently chosen color in the color chooser. Interpolate. Apply a linear interpolation from where you started dragging the breakpoint to the color value of where the breakpoint is currently at while dragging. Transparency. Apply the given transparency value (in the editable pull down menu) to the color table where you are dragging the breakpoint. The editor uses "breakpoints" indicated along the top of the color legend bar with little triangles and a number. Clicking on a break point makes it active. The number on an active breakpoint is in bold characters. There is only one active breakpoint at a time. Making a new breakpoint makes the new breakpoint active. Breakpoints are used for a number of things: showing the data value at a point along the color table and changing colors specific color values or ranges. The values on the breakpoints are determined by the position of the breakpoint along the legend, proportional to the min and max of the Range. Changing the minimum and maximum of the Range changes the break point values. Move in bigger steps with the shift-arrow keys. Right-click on the breakpoint and use the pop-up menu item Change Breakpoint . If you have the "Actively set color" checkbox selected then when you change the color in the color chooser at the bottom then that color will be applied to the color slot under the selected breakpoint. This allows you to set the color of a specific color slot. Add a new breakpoint where you clicked on the legend. Add a new breakpoint at a data value. You will be given a dialog box to enter the value in. Add a new breakpoint on the left end. Add a new breakpoint on right end. Starting with the color at the active breakpoint, interpolate colors to the left up to the next breakpoint. Starting with the color at the active breakpoint, interpolate colors to the right up to the next breakpoint. Starting with the color at the active breakpoint, fill colors to the left up to the next breakpoint with that single color. Starting with the color at the active breakpoint, fill colors to the right up to the next breakpoint with that single color. All color table values from the active breakpoint to the next breakpoint to the left are set with the transparency value. All color table values from the active breakpoint to the next breakpoint to the right get the transparency value. You can modify an existing color table, or edit an existing color table and save it with a new name to make a new color table. Any new or modified color table can be saved for future use. To save a new or modified color table simply select the the File->Save menu item. To save a modified color table as a new color table, select File->Save As and enter the new name in the dialog box that appears. This new color table will now be permanently saved in your local collection of color tables. To save a color table as a file which can be shared with others in their IDV, select the File->Export menu item. A file dialog will appear that will allow you to save the color table as an XML-format file. We suggest you use a file extension of .xidvct. To use a color table as a file which has been supplied to you by another IDV user, select the File->Import menu item. A file dialog will appear that will allow you to find the color table as an XML-format file. The Color Chooser, in the lower half of the Color Table Editor window, allows you to select any possible color. There are two tabs on the chooser, HSB and RGB, each with its own control panels. The RGB panel shows a window that lets you specify any color by slider bars for R, G, and B values. R, G, and B are red-green-blue settings that control the intensity of the color guns in a CRT. The only color sample of an RGB value is the color of the active breakpoint in the legend, which can be pretty small and hard to see clearly. Also, RGB values are not intuitive -- to get yellow you mix equal amounts of red and green in RGB. We recommend you use the HSB chooser panel unless you have specific RGB values to set. The HSB chooser allows you to control color by hue, saturation, and brightness, thereby making any color. With the HSB panel and tab shown, click on one of the circles marked H, S , or B for the corresponding control for hue, saturation, or brightness. Hue is the term indicating a pure color selection from the spectrum. Saturation is an indication of how much white is added to the hue. 100% saturation is pure hue with no white. Brightness is an indication of how much black is added to the hue. 100% brightness has no black and maximum brilliancy, but can be any saturation from the hue to pure white. 0% brightness is solid black. Some "colors" are not found in the spectrum and are a mixture of a hue and black or white or both black and white. For example, brown is red-orange and some black. Grays are any hue with low saturation and some degree of brightness from black to white -- basically a mixture of white and black. You need only use one of the controls for H, S, or B to make any color. It's merely a matter of which one is easiest for you. Often the H control is the easiest and most intuitive to use. We often think first in terms of colors (hues), and next in terms of how pale or dark a color of that hue we want. The H control works that way. You can select any possible color with the HSB color chooser in the H setting. The slider bar chooses the pure hue. Once you have chosen a hue, clicking or dragging the mouse on the square color display chooses degrees of saturation and brightness -- how much white or black is added in -- for that hue. Using the HSB Hue display you can make any color after a little practice. Note that the right edge of every hue chooser is a gray scale, and the bottom is pure black. Select hue and brightness by dragging the mouse over the colored square.The bottom is always solid black. If you want true shades of colors -- pure hue with only black and no white -- use the S control with the slider at the top. There are no grays or pale colors in this case. Select hue and saturation by dragging the mouse over the colored square.The bottom is always pale gray going to white. If you want to use colors that are all at full brightness, use the B control with the slider at the top. Note that colors such as brown are not available in this setting, and there are no dark colors. All controls in the HSB panel show the RGB values for any color selected, in case you need to know the RGB values for another use.